Proprietary Name: Acetaminophen (red) What is the Proprietary Name? Non-Proprietary Name: Acetaminophen (red) - Acetaminophen Capsule Liquid Filled What is the Non-Proprietary Name? 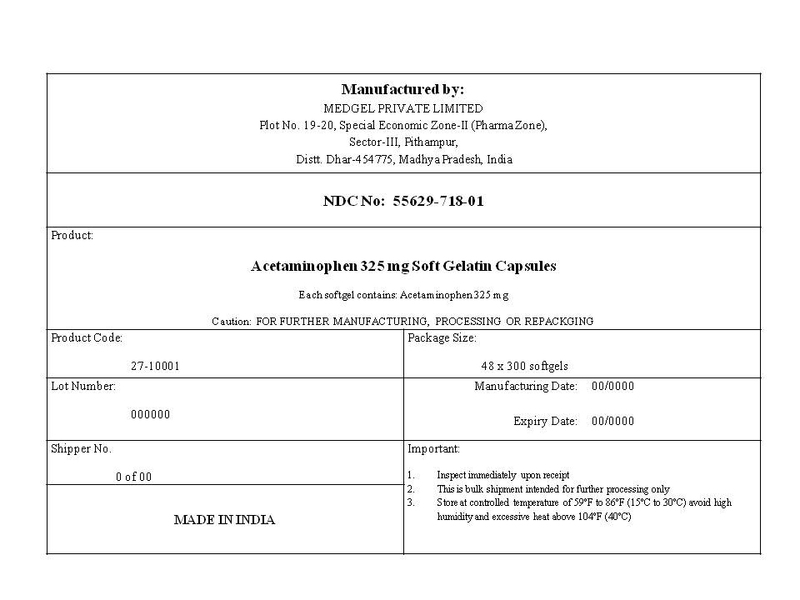 Acetaminophen (red) with NDC 55629-718 is a a human over the counter drug product labeled by One2zee Limited Liability Company. The generic name of Acetaminophen (red) is acetaminophen (red) - acetaminophen capsule liquid filled. The product's dosage form is capsule, liquid filled and is administered via oral form. Pain gets worse or lasts more than 10 days in adultspain gets worse or lasts more than 5 days in children under 12 yearsfever gets worse or lasts more than 3 daysnew symptoms occurredness or swelling is presentThese could be signs of a serious condition.